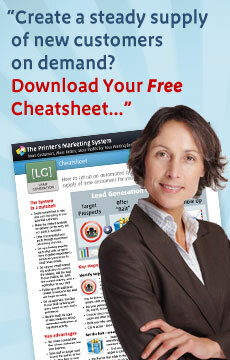 The Printer's Marketing System - Web Traffic Building. Help print buyers find your website, give them reasons to stay and keep them coming back. Building your website is only the beginning. Now you can realize the potential of your online investment with a system designed to attract qualified traffic to your site and keep your visitors coming back for more. If yours is like most small printing businesses, there's a missing link between your investment in your company's web site, and the profits it was supposed to generate – visitors. Our [WT] Web Traffic Module gives you tools and systems to drive print buyers to your web site, so you can finally leverage your online ordering systems to produce revenue. We supply a standalone web site which integrates seamlessly with your existing site, and which adds an essential missing ingredient: it is full of rich content and was designed from the ground up to work as a marketing machine. The site is integrated with our lead generation and social media modules, for a high degree of automation and viral interaction. It is designed to keep visitors returning and engaged deeply, so you can position your company as an authoritative, trusted source, and be in place to win print orders online. The Marketing Partner Program gives you all the benefits with none of the work. We will install and run the site for you, so all you have to do is process new orders and follow up on new leads.